A surviving spouse or registered civil partner is entitled to require the personal representative to use the residuary estate to purchase his interest for life in the one half share of the residuary estate from him. To do so he must give notice of the requirement within 12 months to the administrators of the estate, or if he is the only administrator, to the Senior Registrar of the High Court. The value of the life interest is calculated by using the tables set out in the Intestate Succession (Interest and Capitalisation) Amendment Order 2008 (ST2008/3162) which can be consulted on the website of the Parliament. the right cannot be exercised unless a court is satisfied that it is not likely to diminish the value of the other assets in the residuary estate or make them more difficult to dispose of. If the deceased left a surviving spouse or registered civil partner and issue, the issue inherit one half of the residuary estate on the deceased’s death and the other one half of the residuary estate after the death of the surviving spouse or civil partner as the case may be. If the deceased left a surviving spouse or registered civil partner and no issue, the one half of the residuary estate not inherited by the surviving spouse or partner absolutely is inherited by the deceased’s parent if one survives him, or if no parent has survived, by brothers or sisters of the whole blood and issue of deceased brothers and sisters of the whole blood, the issue of the deceased brothers or sisters inheriting equally between them the share which their deceased parent would have taken had he survived. If the deceased left no surviving spouse or civil partner but left issue, the net estate is inherited by the issue. If the deceased left no surviving spouse or civil partner and left no issue but left a parent or parents, the net estate is inherited by the parent(s), and if both, then by them equally. If the deceased left no spouse, civil partner, issue, or parent, the net estate is inherited by the following classes of people living at the death and in the following order so that if there is no-one in a class living at the death the subsequent class inherit viz. Brothers and sisters of the half blood, or if none, brothers and sisters of the half blood or if none, grandparents or if none, uncles and aunts of the whole blood or if none by uncles and aunts of the whole blood. 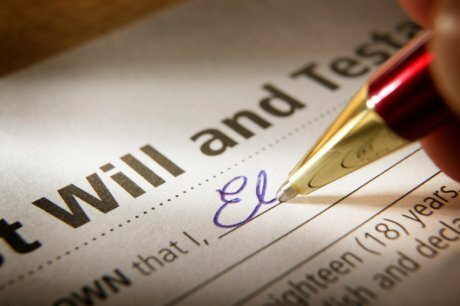 If the deceased was survived by none of the above, the Crown, the Duchy of Cornwall or a Duchy of Lancaster inherits the estate. A person is considered to be a spouse for the purposes of the laws of intestacy until a decree absolute (not a decree nisi) of divorce or a judicial separation (other than in the magistrates’ court) has been pronounced, and to be a civil partner from when the partnership is registered until it is dissolved.